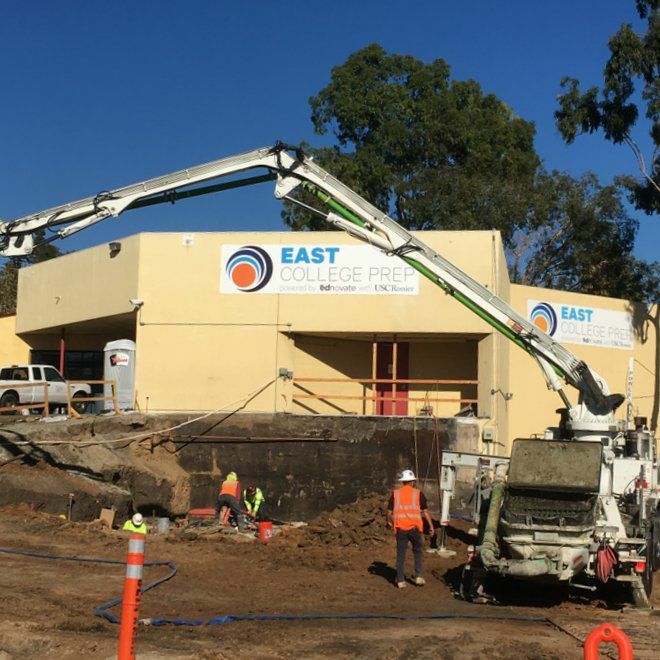 Lincoln Heights — East College Prep is building a larger high school campus to accommodate increasing enrollment at a time when other charter school operators are closing amid growing competition for a shrinking pool of students. The new space now under construction at Mission Road and Parkside Avenue includes a new structure that will be tied to the existing building. It will add 8,400 square-feet over two floors, with four classrooms and one open studio space on each floor (8 classrooms total). While the construction is being done, the school, operated by Ednovate, has temporarily relocated to the World Trade Center building in Downtown Los Angeles for the school year. “We are excited to continue to offer a high-quality, college prep option for students in Lincoln Heights and the neighboring communities,” said Drew Goltermann, Principal of East College Prep. The high school opened its doors in 2014 and there are 400 students currently enrolled. This school year is the first time they have all four grades (9-12) and its first graduating class of seniors. The majority of the students come from Lincoln Heights, Boyle Heights and El Sereno. “I believe parents want their children to come here because of our strong focus on college prep and our 100% college acceptance rate,” added Goltermann. The expansion should be completed by the next school year, according to Goltermann.